Start improving the number of visitors who come to your local store from paid search engine marketing (pay-per-click advertising) such as AdWords, Bing and Facebook, with a local PPC strategy from the experts at Wiideman Consulting Group. If you have more than location, you might be interested in our multi-location SEM/PPC strategy service, which includes a hierarchical account structure and elaborate segmentation of geographical and landing page optimization tasks. For single-location businesses, we offer a very simple, yet very effective approach to keep costs down and maximize return on your advertising dollars. In most cases, our recommendations have resulted in immediate improvements in ROAS and CPA. What’s in a Local PPC Plan? Below in an example of a local AdWords desktop ad targeting the search phrase “downtown long beach hotel”, which includes location and phone extensions to maximize conversion rates. Above, the same query results in a mobile ad with sitelink extensions to take over most of the visitor’s phone display. We also review competitor insights, such as top-performing ads, keywords, and competitor landing pages, to assist us in making recommendations based on what has worked for you as well as competitors. Within 20 business days, your paid search specialist will have a comprehensive audit and strategy to help continuously improve ROAS, Quality Scores and ultimately the volume of visitors your local store or office receives from paid advertising. Below is a video from a webinar we lead with Search Engine Journal, discussing how local search works and what our large brands are doing to improve local rankings that can also impact paid search Quality Scores over time. Below is a screenshot from the Google Analytics account of a recent client who allowed us to share his results (provided we kept his business private). 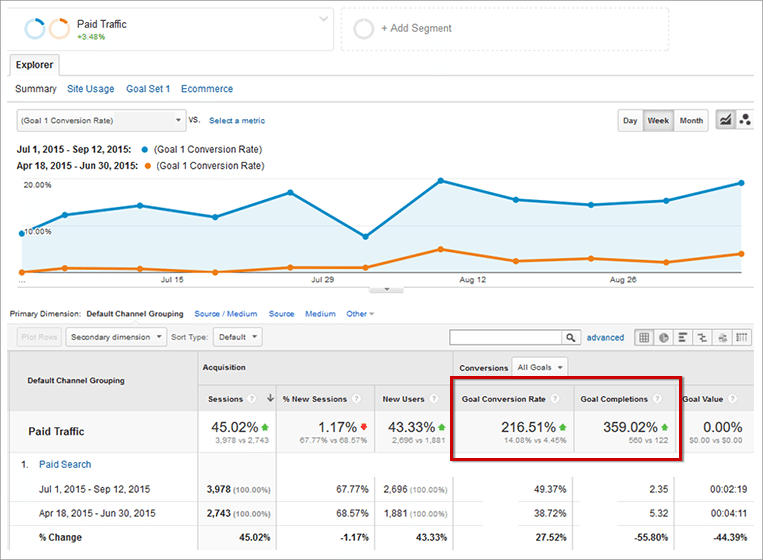 Notice how our strategy not only helped improve and grow paid traffic but also significantly improved conversions. In this case, it was a coupon download to come into a nearby store. At Wiideman Consulting Group, we understand that sale professionals can not answer tough questions you might have about your local SEM strategy or problems you’d like to have researched. Therefore, your assessment call will be with a paid search strategist, not a salesperson. Call us today at (562) 732-4417 or contact us online to schedule an introduction.